I love lettuce wraps for lunch or dinner because they are not only a novel idea, but they are a great change from eating bread based sandwiches all the time. 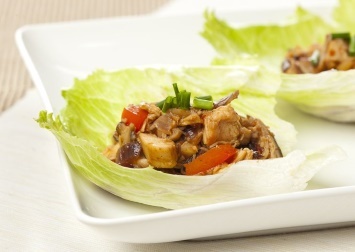 This chicken lettuce wrap recipe has a soy sauce based sauce and is studded with bits of ginger for a fantastic Asian flavor. They are low carb, gluten free (make sure you have gluten free soy sauce) and a wonderful diabetic recipe. In a medium bowl combine the chicken, red pepper strips, ginger, garlic and red pepper flakes. In a cup blend the soy sauce and cornstarch until smooth. Heat a large skillet or wok over medium-high heat. Add the oil and heat until hot. Add the chicken mixture. Cook, stirring constantly, for 2 to 3 minutes until the chicken is cooked through. Stir the soy sauce mixture and add to the wok. Stir-fry for 30 seconds or until the sauce boils and thickens. Add water chestnuts and chopped peanuts if using and heat through. Divide the filling evenly among the lettuce leaves. Serve warm. Although romaine or Bibb lettuce has been suggested for this recipe, you can use whatever lettuce you want. The leaves just need to be large enough to act as a cup or wrap for the filling, so greens like arugula wouldn’t work well. A lettuce with a nice crunch to it is best. If you need this to be abolutely gluten free, please make sure that your soy sauce is gluten free. Some of them are not. If you are diabetic you probably know that high carb foods like bread and pasta are not great for you in large amounts. They raise your blood sugar just like sugar. A recipe like this one that uses cold, crisp lettuce leaves as the wrapper for the filling is a perfect solution. Enjoy the chicken, get a bit of nutrition from the lettuce and keep it low carb. Of course the nuts are optional. They add a great crunch and flavor, but if you are allergic or just don’t like them, leave them out. Chopped almonds would be nice too if you are using the nuts. If you like these Asian lettuce wraps you can browse our Asian recipe collection for more great ideas. Look here for more suggestions for diabetics. Look here for more gluten free recipes.